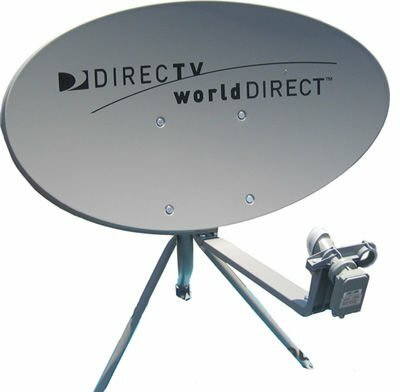 DirecTV International World Direct Satellite Dish DTV36EDS by DIRECTV at Home Entertainment Centers Online. MPN: 4331051342. Hurry! Limited time offer. Offer valid only while supplies last. New smaller sized 36'' x 24'' DIRECTV satellite dish used to pick up DIRECTV WorldDIRECT international programming channel on 95W and 101W satellites. New smaller sized 36" x 24" DIRECTV satellite dish used to pick up DIRECTV WorldDIRECT international programming channel on 95W and 101W satellites. LNBFs included. Linear and Dual LNBFs for simultaneous reception of 95° West and 101° West satellites What's in the BOX: DirecTV 36" International Dish (87CM) For International / Ethnic DirecTV Programming Includes (1) DTV36EDS WorldDirect International Dish Includes (1) Required LNB for 95 WL Satellite Includes (1) Required LNB for 101 Satellite Includes (1) Required Bracket to hold 101 and 95 LNBs Includes (1) Required Universal Mounting Bracket Includes (1) Easy to use Instructions Brand New Factory Packaged Product!